A hearty addition to traditional meals! Scrub potatoes and pierce four times with a long tined fork. Bake in 400 F. oven for 45 minutes to 1 hour. Hold hot potato in one hand with an oven mitt or hot pad and slice skin from long side of potato. Scoop out pulp into mixing bowl leaving potato skins intact. Add butter, milk, sour cream, pepper, 3 Tablespoons bacon and 1/4 cup cheese to potato pulp and stir together while mashing potato. Pile potato mixture into potato skins. 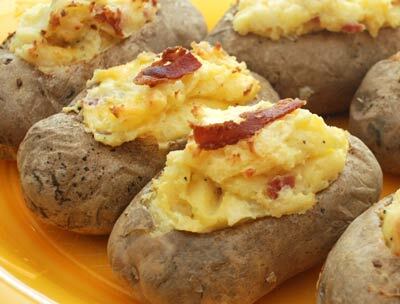 Top each potato with remaining 2 Tablespoons cheese and bacon. Return potatoes to 400 F. oven for 10 minutes until cheese melts and just begins to turn golden brown.